Born Richard Grant Esterhuysen, 5 May 1957 is a Swazi born English actor, screenwriter and director. Richard was born in Mbabane, Swaziland. He adopted the surname Grant when he moved to the UK as an adult and registered with the British Actors' Equity Association. Grant wrote and directed the critically acclaimed 2005 film, Wah-Wah, loosely based on his own childhood experiences. A screenwriter recommended he write a screenplay, after reading Grant's memoirs of his Withnail and I experience. He married voice coach Joan Washington in 1986 and has one daughter with her (Olivia) and a stepson (Tom). Grant is a teetotaler. After casting him as the alcoholic Withnail, director Bruce Robinson made Grant drink a bottle of vodka in one sitting so that he had experience of the sensation. 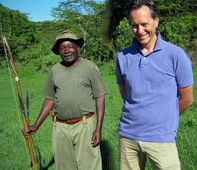 Richard E Grant - who grew up in Swaziland - examines the controversial history of the safari. Exploring the world of the big game hunters and the luxury of today's safaris, he goes on a personal journey to experience how the beauty of the bush made Africa the white man's playground. Plotting the major landmarks in the development of the safari, Grant uncovers a world of danger, glamour and gung-ho. He reveals how the safari was continually reinvented as explorers and ivory hunters were replaced by white settlers, guns gave way to cameras and direct British rule to independence. He discovers how safari became one of the central constructs through which British rule over East Africa was imposed, provided the social touchstone for the white settlers and was eventually transformed by the glamour of Hollywood, the power of the dollar and the traveller's desire for an 'authentic African experience'. Richard E Grant, a diarist since childhood, uncovers the power of the diary. He considers the diaries of Joe Orton, Kenneth Williams, Erwin James, John Diamond and Rosemary Ackland and asks whether a diary should, or could, ever be totally honest, wholly accurate and absolutely true. Richard talks with Joe Orton's sister, Leonie, about her long-held belief that Orton's confessional diary was actually responsible for him losing his life. He also meets prison diarist Erwin James to understand the power of writing for a serving offender. Joss Ackland tells Richard about editing his wife's 50-plus years of diary writing, and Richard meets with Sheila Hancock to talk about Kenneth Williams's diary, in which she appeared many times. Williams had a charming public face but in the diaries he could be savage. He even wrote that he'd never again speak to Sheila Hancock. Set at the end of the '60s, as Swaziland is about to receive independence from Great Britain, the film follows the young Ralph Compton, at 12, through his parents' traumatic separation, till he's 14. It is written and directed by Richard E Grant, and based on true events from Richard E Grant's childhood. Simon and Minty are two 'posh' chefs who specialise in cooking extravagant, expensive food, and have little time for those who don't. This comedy series focuses on one type of cooking each week, and generally results in tensions or underlying issues being revealed in the couple's relationship. How To Get Ahead In Advertising. This is a film which attacks consumerism from within. Richard E. Grant's character starts out as a top advertising executive who ends up through the stress of his job, a manic loonatic running around his garden naked, making video blogs (before its time) to his wife with a cardboard box on his head and setting defrosted chickens free down the toilet. Once seen, never forgotten. It's very British, and very 80's, but its message is still as universal as ever. Fans of Withnail & I will not be dissapointed for sheer originality and inventiveness (it has the same writer / director - Bruce Robinson). Richard E as Mr Greb and Julie Walters - together. Dream combination. 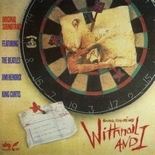 A bit of Withnail and I plus Personal Services (1987) blended by experts. Set in part in Southend, Essex, a look at mummy's boy Mr Greb being "seduced" by boozy Julie Walters as he searches for his long lost Dad. Denholm Elliot plays Julie's boyfriend. Lovely one-liners such as the bit where Denholm returns drunk to the Hotel they are staying at (long-term) and Julie is annoyed, so shouts "Matty, you will not treat my home like a hotel". Marvellous. Bruce Robinson's semi-autobiographical account of his early years as an actor has become a cult hit of massive proportions, inspiring countless numbers of young men and women to quote stars Paul... Bruce Robinson's semi-autobiographical account of his early years as an actor has become a cult hit of massive proportions, inspiring countless numbers of young men and women to quote stars Paul McGann and Richard E. Grant and their booze-soaked dialogue. The story follows these two unemployed actors in 1969 London, as they take a holiday in the country. Trapped inside a dank, empty cabin with each other, an endless downpour of heavy rain battering their roof, the two men form a complicated bond fueled by booze, disaster, and nihilism. Though not much happens in terms of plot, WITHNAIL AND I is one of the most subtly hilarious films to come out of 1980's Britain. There have been many guests on this show, but I record those I personally like... and most were interviewed by Paul Merton with some early editions by Nick Hanock.